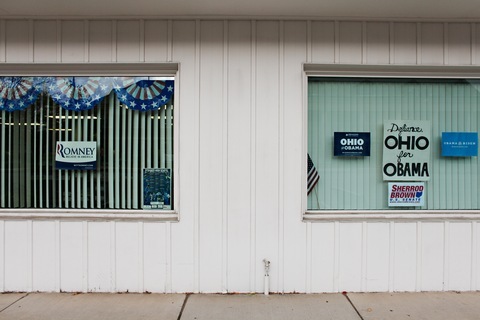 Opposing campaign signs are displayed on Clinton Street in Defiance, Ohio. Photo by Joel Prince for The Washington Post via Getty Images. Twelve days until Election Day and, to almost no one’s surprise, the presidential election appears to be coming down to one state: Ohio. The Buckeye State will be the center of the political universe once again Thursday as both President Obama and Mitt Romney make stops there. The dueling visits come as a Time magazine poll released Wednesday found Mr. Obama leading his GOP rival, 49 percent to 44 percent, among likely Ohio voters. The survey has a sampling error of plus or minus 3 percent. The poll also showed Mr. Obama with a big advantage with Ohioans who have already voted, winning them 60 percent to 30 percent. The two candidates are tied at 45 percent a piece among those who have yet to cast their ballots. Democrats also say they have an edge in early voting in states where it has begun. In Iowa, North Carolina, and Nevada, more Democrats than Republicans had cast ballots as of Monday. In Ohio, more votes had been cast from precincts Obama won in 2008 than from precincts won by McCain. In Florida, more Republicans had cast ballots — absentee balloting is typically a GOP strength in the state, and early voting, which Democrats tend to dominate, has not yet begun. But Florida Democrats note that Republicans’ early advantage is reduced from this point in 2008. Mr. Reid’s organization is a large reason that Mr. Obama is favored by many analysts to win narrowly in Nevada, despite what may be the worst economic climate in the nation and a sizable population of voters who, like Mitt Romney, are Mormons. Mr. Reid, who has long been strongly supportive of Mr. Obama in Washington — he maneuvered the president’s health care bill through legislative hoops to an unlikely victory in the Senate — has made it clear that he views a victory for Mr. Obama in his state as a personal mission. This reflects not only his admiration for the president but also his visceral dislike for Mr. Romney, expressed in constant needling and attacks for almost six months. If President Obama is able to put Ohio and Nevada — and their 24 combined electoral votes — in his column, it would leave him just nine electoral votes shy of the 270 he needs for re-election and a variety of pathways to victory. For Romney, the challenge would then become sweeping Colorado, Florida, North Carolina, Virginia and Wisconsin, along with either Iowa or New Hampshire, in order to clear the 270 threshold. Try it for yourself in our Vote 2012 Map Center. President Obama became the latest Democrat to weigh in. But Democrats weren’t the only ones condemning Mourdock’s remarks. During an appearance on CNN, Arizona GOP Sen. John McCain was asked if he stood by his endorsement of Mourdock. “It depends on what he does,” McCain said. “If he apologizes and says he misspoke and he was wrong and he asks the people to forgive him, then obviously I’d be the first,” McCain added. The Romney campaign said the GOP presidential nominee disagreed with Mourdock’s comments but did not ask that the television ad featuring the former Massachusetts governor voicing his support for the Senate candidate be pulled from the air. Amid the ongoing fallout Wednesday, Gwen Ifill took a look at the Indiana Senate race, along with three others that are surprisingly competitive — Arizona, Connecticut and North Dakota. Nathan Gonzales of the Rothenberg Political Report told the NewsHour that Republicans must win three of those four to wrest control of the Senate from Democrats. And it’s looking like an uphill battle. Also joining Gwen for the segment was Roll Call’s Shira Toeplitz, currently on a Rust Belt Road Trip. Toeplitz was at Tuesday’s debate in Indiana and attended Mourdock’s Wednesday press conference where he apologized to those who misunderstood his comments but stood by his intended meaning. Team Obama has started airing new ads designed to startle base voters into showing up, focusing on what would happen should the president lose his re-election bid. A tax-focused ad with similar images and narration is running in Ohio. There’s also this women-focused spot that includes Romney’s comments about “overturning Roe v. Wade” and defunding Planned Parenthood. It’s airing in Ohio. So, what states are getting the most action in terms of television ad spending? That would be Iowa, Ohio, Nevada and Virginia, according to data compiled for the NewsHour and NPR by Kantar Media/CMAG. NPR’s Mara Liasson will be reporting on the data. Watch her give a preview on Thursday’s NewsHour. The median inflation-adjusted income for senior Americans has more than doubled since 1962….One reason seniors were, on average, better off financially is monthly Social Security payments, which have risen faster than inflation and in 2010 averaged more than $1,200 per retiree. Another reason: more than three times as many seniors got private pension payments in 2009 compared with 1962. A new Associated Press poll finds Romney leading Mr. Obama, 47 percent to 45 percent, among likely voters nationally. Romney’s standing was bolstered by the fact that he erased the president’s advantage among women, going from a 16-point deficit last month to a 47-47 tie. Mr. Obama leads, Romney 51 percent to 47 percent, among Nevada voters, according to the latest automated survey from the left-leaning Public Policy Polling. NBC News released portions of Brian Williams’ interview with Mr. Obama on Wednesday, largely regarding the closeness of the race. The full conversation, which airs Thursday night, may mark the last time either candidate will be seen on the largest national media forums before Election Day. Have a hankering for more presidential debates? The third party candidates this year can sate your interest. The NewsHour’s Kwame Holman gave an overview of their debate highlights from Tuesday night in this segment. You can also watch the third party candidates debate in full here. The Huffington Post outlines the well-oiled Democratic Party organizations in swing states. The White House changed its mind on that off-the-record conversation with the Des Moines Register and agreed to release the candid talk’s transcript. NewsHour’s Jessica Fink and Geoffrey Lou Guray round up the reactions of a crowd of college students to Monday night’s debate. The NewsHour Listen to Me project looks at voters in Virginia. The Chicago Sun-Times’ Lynn Sweet checks in on the state of the race in Florida and McCain’s event there Wednesday. Errors in Maryland’s online voting registration system will cause hundreds of residents to fill out provisional ballots on Election Day. The state has also noticed that some voters have received absentee ballots with a page missing, the Washington Post reports. Virginia’s attorney general is investigating a man who may have stashed completed voter registration forms in a dumpster. The Milwaukee Journal Sentinel won’t pen candidate endorsements for president or Wisconsin’s close Senate race. This year’s October surprise may be in the hands of Mother Nature. Get your hat and gloves ready because some swing state weather watchers, including Kevin Myatt in Roanoke, Va., are predicting snow. Vote Our Future Now has purchased sarcastic, youth-focused political ads like this one as pre-roll on Mat Kearney videos on YouTube. With everyone distracted by the president, one brave boy used the moment to kiss a girl. Minnesota Vikings punter Chris Kluwe gets political recording an ad in support of gay marriage. Virginia Democratic Rep. Jim Moran’s son was caught on video speaking with an activist who suggested methods of voter fraud. Moran’s son Patrick resigned from the campaign team. Hillary Clinton may not leave her post as secretary of state if Mr. Obama wins a second term, the Wall Street Journal reports. Billionaire casino owner and major conservative funder Sheldon Adelson has made his mark on the U.S. Senate race in Virginia, with a near-record $1.5 million donation. President Obama hits a trio of battleground states and also casts an early vote (for himself, the Morning Line assumes). He starts the day with a 9 a.m. rally in Tampa, Fla. From there it’s on to Richmond, Va., for a 1:40 p.m. event. He then goes to Chicago to cast his ballot before finishing up with a rally in Cleveland at 8:30 p.m.
Mitt Romney also campaigns in Ohio, with three events scheduled. He holds an event in Cincinnati at 11 a.m., then travels to Worthington for a stop at 3:10 p.m. His third event is a 7:35 p.m. rally in Defiance with country music singers John Rich and Randy Owen. Vice President Biden travels to Sioux Falls, S.D., where he attends a prayer service for George McGovern at 7:30 p.m. The vice president overnights in Oshkosh, Wis.
Paul Ryan campaigns in Virginia with a pair of events scheduled. He makes a stop in Bristol at 12:30 p.m. and then goes on to Charlottesville for a rally at 6:45 p.m.
Michelle Obama attends a campaign event in Los Angeles at 5:15 p.m. and tapes an appearance on “Jimmy Kimmel Live” that will air at 12:35 a.m.